DZone syndicate some of my blog entries. I used to keep a list by hand, but it is easy to get out of step that way. That’s a manual process too, so why not automate it? // article and stats for it are sibling elements, not parent/child. 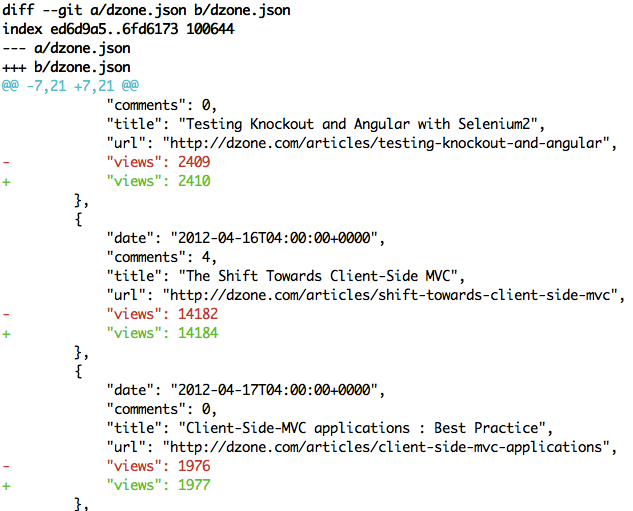 results.articles = articles.reverse() // JSON diffs look better. The JSON is consumed by AngularJS, and you can see it at http://paulhammant.com/dzone.html. Given I have used AngularJS, the page won’t be indexed by search crawlers presently. That’s not a problem to me, really, as I don’t want DZone’s rankings for my articles to be higher than the originals. DZone sometimes change the titles, I note. Perhaps this is interesting only to people who’s blogs are aggregated into DZone, and until the DZone people make a proper feed. Of course they may have that already, and I missed it.